Troy Lee Designs 5205 Wrist Supports give you all the wrist protection you need without compromising your comfort. 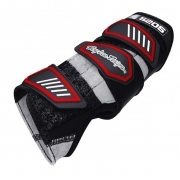 Constructed of vented neoprene with reinforced binding. A close-fitting micro-fibre synthetic leather palm gives it a glove-like feel.